Another disturbance will eject outward into the southern plains tomorrow evening and will be a trigger for severe weather, some of which could be significant. Currently, as evidenced by a RAP analysis and water vapor satellite, this disturbance is located near far southern California. This will eventually round the base of the trough and eject out into TX/OK tomorrow evening. There is also another very subtle feature that I am watching, that is of concern for tomorrow, a possible lead speed max over southern baja California, that could set off some early afternoon thunderstorms. It’s always important to look at the surface too, to know what’s up! It’s especially important however, now, since there has been a few days of convection and it’s crucial to see frontal boundaries and moisture locations! We see a surface low across southeast Kansas. 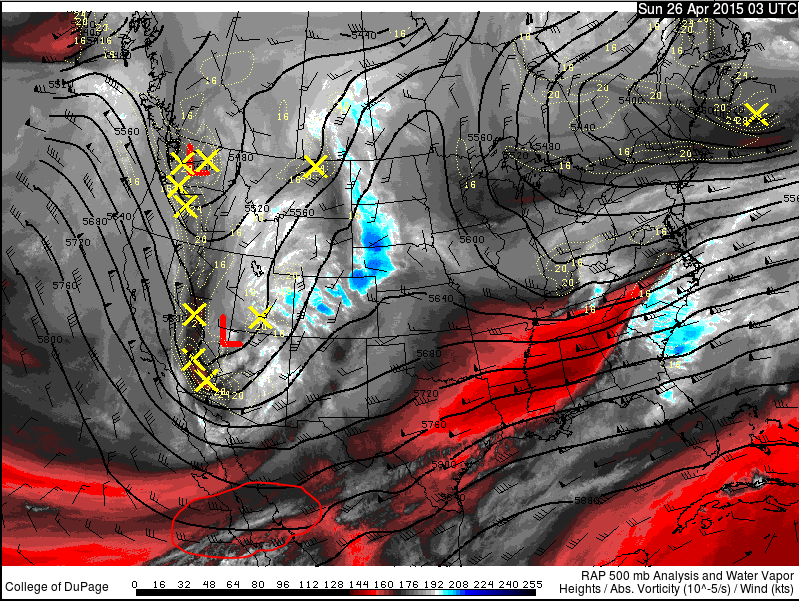 With height falls overspreading the southern plains, this low will continue to deepen, and moisture will advect north. 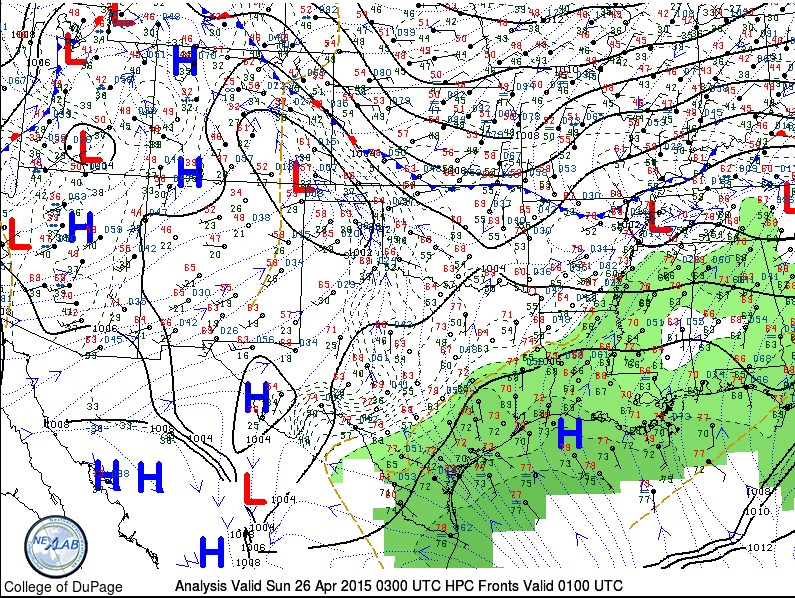 The deeper moisture is across southern Texas, in the wake of the surface low that moved out of the area today, and produced some severe weather across Dixie Alley and vicinity. The moisture will be critical to the ultimate severe weather outcome tomorrow. If moisture can return rapidly northward, then a substantial severe weather threat is very likely to develop, whether that will be with tornadoes and/or very large hail, remains to be seen. Moisture is not incredibly deep, which may yield some problems tomorrow (note the CRP sounding is pretty dry after the moist layer near the surface). Regardless, moisture will continue to improve tomorrow afternoon. Given the meager moisture in place, wave timing, etc, I don’t see substantial cloud cover or morning convection being a major issue tomorrow, which is a plus for us chasers! There are some major differences in the models this evening, which makes this a tough forecast! I hate sticking my neck out and making a call, but sometimes you just have to do it! The main concern is moisture return. 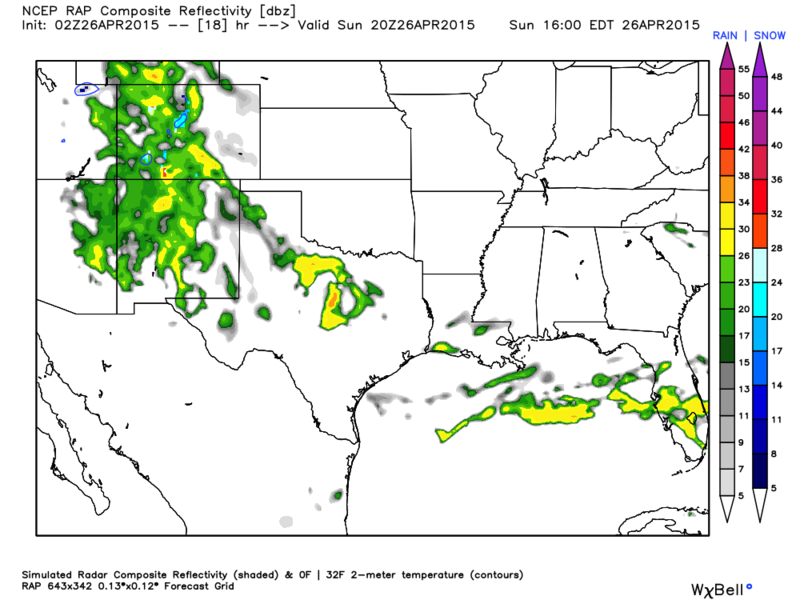 This will have substantial impacts on convective evolution and severe weather threat/type. If substantial moisture fails to make it northward in time, then damaging winds and large hail will be the main threats. The lapse rates and wind shear certainly support both of these threats, especially large to very large hail. If moisture DOES arrive in time, then we have to bring out the T word! Tornadoes will certainly be a threat, with substantial low level shear. This of course won’t matter though, if storms form quickly into an MCS, like some convection models indicate. There looks to be two potential rounds of thunderstorms tomorrow.. The first, possible elevated storms may develop slightly east of the dryline tomorrow in response to the lead speed max. I will just say now I am not completely sold on this. It does appear to be a signal in the convection models, as well as the latest few runs of the RAP, so it may be more likely than not. The main question if this happens, is the recovery of the atmosphere behind this line, prior to the arrival of the more substantial energy, that is seen rotating around the trough, above. Here is the RAP model showing decent amounts of convection ongoing by 3pm tomorrow, likely in response to the lead speed max. This situation is also supported by the latest NSSL WRF model..
Again, the question becomes just how much space there is between outflow from this convection (if it occurs) and what would be tied to the main piece of energy later in the day. Models do have a strong tendency to over-generate outflow, so the atmosphere might not be quite as worked over as is suggested by the CAMs (convection allowing models) this evening. The RAP indicates some attempt at clearing behind the initial convection, which certainly makes sense. 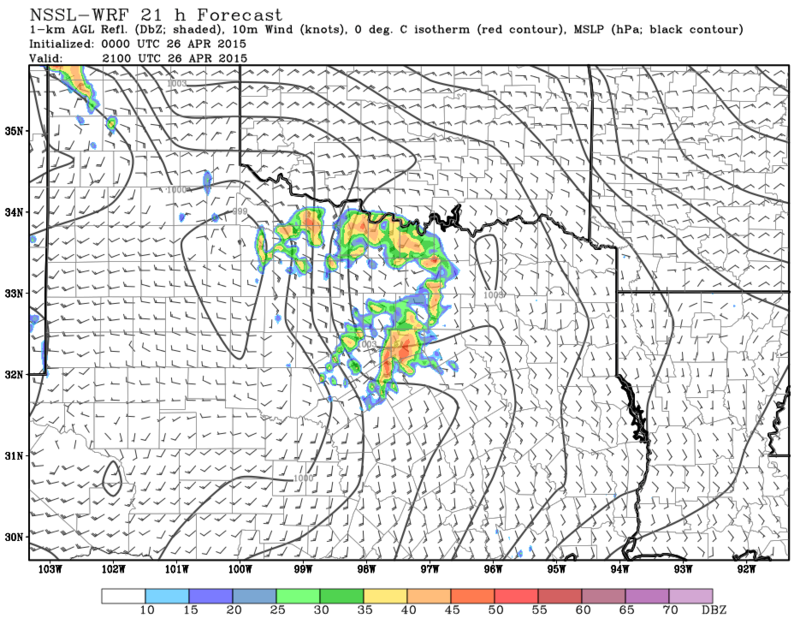 You see below, instability remaining/recovering along the dryline, before the arrival of the upper level impulse. RAP forecast soundings from the area look pretty decent. Certainly supportive of substantial supercells, including tornadoes. Again, and I can’t stress this enough, but timing of moisture return and evolution of convection from earlier in the afternoon are significant influences in the forecast. I have to believe there will be some clearing behind initial convection. If the HRRR hoses the area, and lines up well with observations tomorrow AM, I will be a sad camper. I hate making a chase target public in spots like this, but this is my best guess. 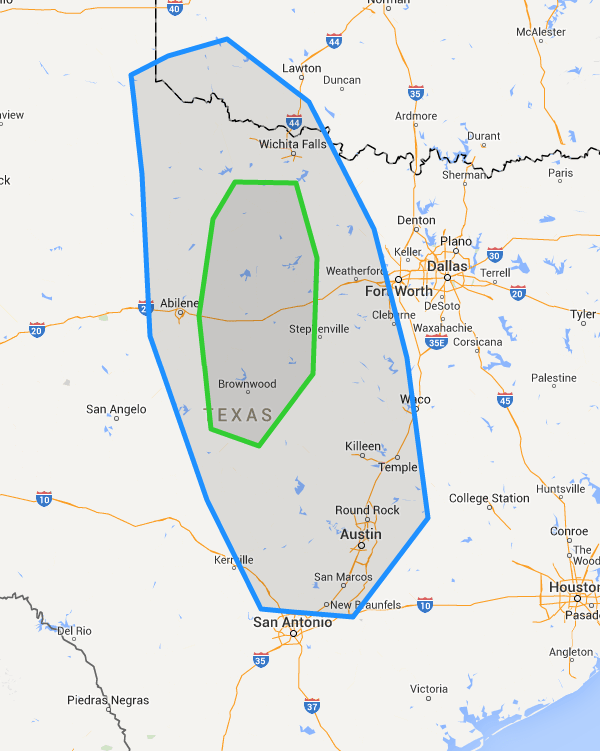 Blue is where I anticipate the tornado threat from SPC to cover (there may be other areas, but my main focus is on chaseable country within driving limits for me), and green is where I am most confident in tornadoes, and am most likely to chase at this time. Severe weather, some possibly significant, is looking increasingly likely across portions of the southern plains tomorrow evening. The main locations look to be southern Oklahoma through central Texas, with the main threats very large hail, damaging winds and tornadoes. An isolated strong tornado is possible depending on convective evolution, which is highly dependent on moisture return this evening.